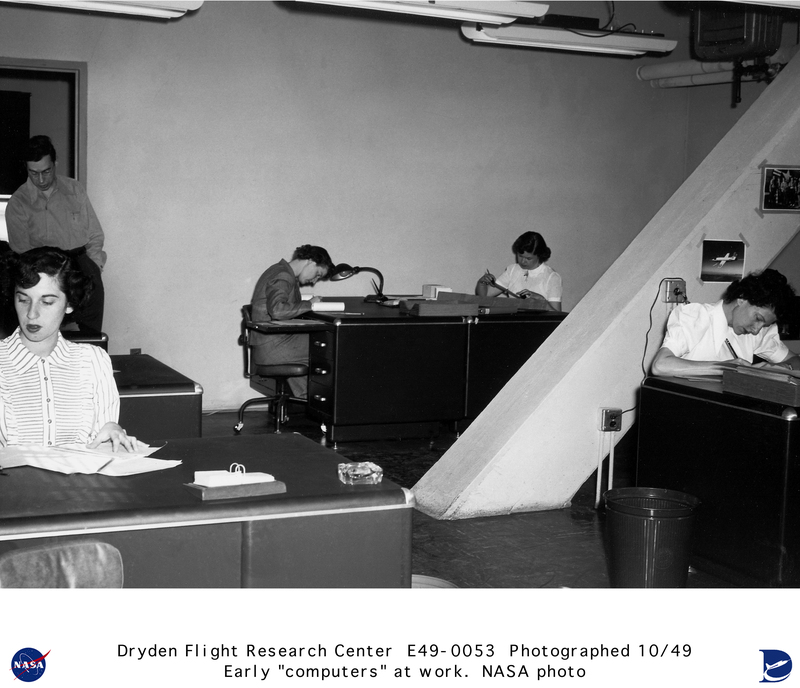 Description: The women of the Computer Department at NACA High-Speed Flight Research Station are shown busy with test flight calculations. The computers under the direction of Roxanah Yancey were responsible for accurate calculations on the research test flights made at the Station. There were no mechanical computers at the station in 1949, but data was reduced by human computers. Shown in this photograph starting at the left are: Geraldine Mayer and Mary (Tut) Hedgepeth with Friden calculators on the their desks; Emily Stephens conferring with engineer John Mayer; Gertrude (Trudy) Valentine is working on an oscillograph recording reducing the data from a flight. Across the desk is Dorothy Clift Hughes using a slide rule to complete data calculations. Roxanah Yancey completes the picture as she fills out engineering requests for further data.